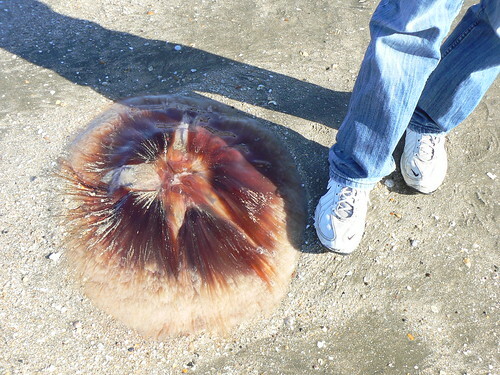 On Takapuna beach the other day, the boy person friend and I came across this rather massive jellyfish. Which was exciting. It was bigger than a breadbin. But check this out, tiny children: it was still alive. This entry was posted in Auckland, Walks and tagged jellyfish, Takapuna, youtube. That is indeed Some Jellyfish! Did you squeal? It was! I did not squeal — I never do — but we did find several more on the beach, including a transparent beige one.